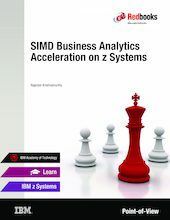 The new Single Instruction Multiple Data (SIMD) accelerator is integrated into the latest IBM z Systems CPUs, starting with the new IBM z13, to enable workloads for acceleration by using new types of instructions that can act on multiple data elements simultaneously, even at the level of a single instruction. SIMD acceleration can help IT organizations meet shrinking batch window times and increasing data throughput requirements for mainframe workloads. It can also be applied to extract real-time insight from financial and consumer transactions, because with acceleration, the workloads can keep up with incoming transaction rates. The SIMD accelerator and software stack allow workloads from previous generation machines to run unchanged on the new z Systems products enabled for SIMD acceleration. Workloads may also be modified and enabled for higher gains with SIMD acceleration.